The glycemic index of plum is 24 which classifies this juicy, red colored fruit under low glycemic index category. The glycemic load of plum is 2 which makes it suitable for people with lifestyle diseases. Is Plum Safe for Diabetics? Plum is very low in glycemic index and won’t raise blood sugar levels instantly. Thus suitable for diabetics in moderation. Is Plum Suitable for Weight Loss? Plum is fairly good source of fiber which helps in slow absorption and control our hunger. It also helps in relieving constipation and thus improves digestion. 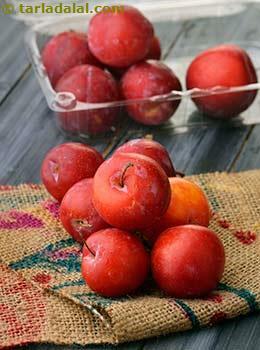 Since it is a low energy dense fruit providing only 38 calories in 2 medium sized plum (approx. 72 grams), mostly advisable for people with weight loss to munch as a healthy snack in between meals. The glycemic index is a measure to signify the ability of the carbohydrate to raise blood sugar levels. It is very crucial for an individual to keep a check of what type of fruits they are consuming in their daily routine, whether its low or high GI.